Pay 'n' Spray is a chain of spray shops/garage that originally debuted in Grand Theft Auto III and has recurred in several subsequent GTA games. Much like other spray shops in the series, Pay 'n' Sprays serve three main functions - to repair a vehicle, to change the paint color, and subsequently allow the player to lose wanted levels. Although the Pay 'n' Spray chain does not actually carry over to forth generation GTA games, tooltips and briefs in Grand Theft Auto IV and Grand Theft Auto: Chinatown Wars still refer to a spray shop as "Pay 'n' Spray"; the name has also been retained in GTA IV as a byline for Auto Cowboys in Northwood, Algonquin, and incorporated into the name of Axel's Pay 'N' Spray in Alderney. Pay 'n' Spray is not to confused with Spray'n'go, a similarly functional spray shop in Grand Theft Auto: Vice City. 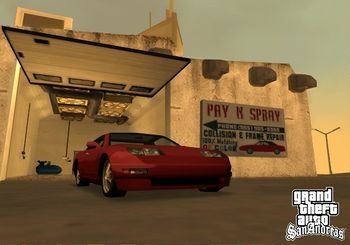 Mod Garages in Grand Theft Auto: San Andreas (Transfender, Loco Low Co., and Wheel Arch Angels), which expand on the concept of spray shops, also exists as separate entities. This article refers to Pay 'n' Spray as an actual chain of spray shops between GTA III and GTA Vice City Stories. For further details on any spray shop in GTA IV and later that are known to as "Pay 'n' Spray", and on the gameplay mechanics of Pay 'n' Sprays, refer to the Spray Shop article. Red Light District, Portland (GTA III). Pike Creek, Shoreside Vale (GTA III). Ocean Beach, Vice City Beach (GTA Vice City). Vice Point, Vice City Beach (GTA Vice City). Viceport, Vice City Mainland (GTA Vice City). Little Haiti, Vice City Mainland (GTA Vice City). Santa Maria Beach, Los Santos. Royal Casino, Las Venturas (Unmarked, and inaccessible in the PC, Xbox, and second PlayStation 2 versions). Pay 'n' Spray was established in the United States in 1974. To restore the disabled Royal Casino, Las Venturas Pay 'N' Spray in the PC version of GTA San Andreas, go to data\maps\vegas folder, open vegasE.ide file with Notepad, found the 8957, vgsEspdr01, vgsegarage, 150, 128 line and replace 128 with 2176. Note that its use can lead to problems with sound; make sure you have a back up for the original file. The entrance of the Pay 'n' Spray in Idlewood, Los Santos is located just in front of a ramp that leads into Los Santos's storm drain. Often if the player drives too fast and jumps on the ramp, the car will go straight into the shop. When using the Northwood Pay 'n' Spray, exit with caution as AI vehicles will often pull into the adjacent driveway and park as you're backing out, leading the risk of a collision. Los Santos Customs, the spiritual successor of the Pay 'n' Spray in Grand Theft Auto V.
This page was last modified on 11 March 2017, at 19:22.